Low-angle annular dark field (LAADF) STEM is performed with electrons scattered through angles just outside the bright-field region. In this configuration, both elastically and inelastically scattered electrons contribute to the detected signal. 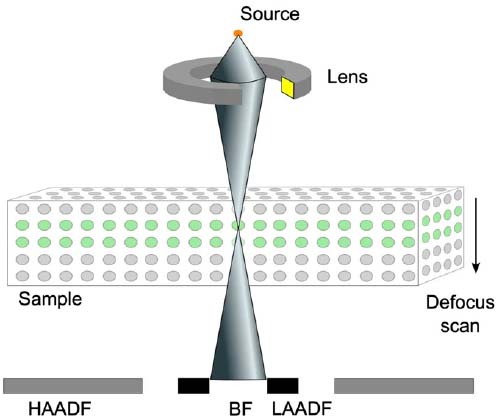 As shown in Figure 2789a, a convergent probe is focused within the sample and an annular detector is placed just outside the bright field disk. Figure 2789b shows the schematic illustration of probe interaction with atomic columns under LAADF condition. Figure 2789b (a) indicates that electrons are scattered out of the probe envelope from the beam waist. In this case, a large fraction of the electron density is focused into a small region in the vicinity of the column, resulting in maximum scattering. Figure 2789b (b) indicates scattered electrons are drawn back within the probe envelope by the atomic column potential and the redistributed intensity propagates towards the forward direction with an increase of transverse momenta. Figure 2789b (c) presents that at the exit surface, outward scattered electrons continue to the detector since there is no more crystal to interact. Gary Ruben, Eireann C. Cosgriff, Adrian J. D’Alfonso, Scott D. Findlay, James M. LeBeau, Leslie J. Allen, Interface location by depth sectioning using a low-angle annular dark field detector, Ultramicroscopy 113 (2012) 131–138.